If you'd told me five years ago you were going to make money by growing your fringe long and singing the lyrically masterful line 'Ohh Baby, Baby Ohh' I would've slapped you with a wet fish and told you to get back to work. Luckily no such party-pooper lives in the world of Justin Beiber, as said haircut and lyric, plus a handful of others has turned him into the current James Dean of the under 13's. Proving he's just a regular guy at heart, the Beebs has done what any red blooded guy would do given more money than God - he's brought a custom made Batmobile. And not only does it make you say 'Ohh Baby, Baby Ohh' when you see it, it's a Cadillac. 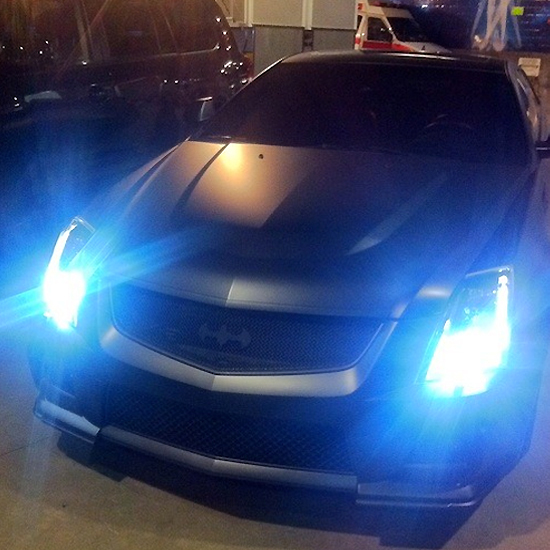 The 'Bat-illac' is a customised Cadillac CTS-V, crafted by Ryan Friedlinghaus of TV show Street Customs fame. It features the Batman logo on the front and rear of the car, and a 'batmobile' nameplate on the trunk. Starting cost of a basic CTS-V - $60k. For images to turn yourself Riddler-green with envy, click the jump. That's so cool! I have to hand it to my fellow countryman. If I were 15 years old, I would just die if he picked me up for a date in the Batillac. I agree ToB it is a pretty mean looking ride. Thanks for the comments! Riddler-green with envy indeed! My dream is to build the Batwing, but of course that would take Bill Gates-level funding. Hey Pensol - good to hear from you again! Tell you what you build that - I'll do the batcopter and we'll race 'em!